See the Divers, The Chapel of Peace, The Diego Rivera´s Mural, Pics Stops and More. Come along for a tour that will show and unveil all what this vibrating city has to offer. Your knowledgeable and fun loving tour guides will share with you all there is to know. Enjoy a guided city tour of Acapulco and explore this one of Mexico's most visited cities. See what all the buzz is about on a guided sightseeing tour of the city that includes entrance fees to The High Cliff Diving Exhibition. You guides will pick you up right at the lobby of your hotel or your cruise ship pier in a fully air conditioned van and will go straight to see The Bay of Puerto Marques for a picture stop. Afterwards if you book with this option, your guides will show you The Chapel of Peace on the very top of Acapulco's Bay, when this visit is over the tour will head downtown to see The High Cliff Diving Exhibition at 1:00 pm. 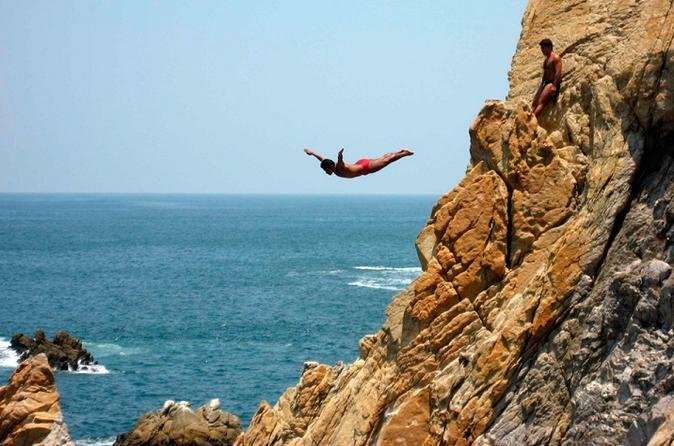 (if you do not see the divers, you did not come to Acapulco). Later on tour will head for one more picture stop on the west of the City and will also take to see the Mural of one of the greatest artists of Mexico Diego Rivera. You will have complimentary bottled water all along the tour. Finally you will head to a small Mexican Restaurant on the main avenue for a Home Made Typical Mexican Lunch. You can have either shrimp or crispy chicken tacos or fajitas with vegetables or salad or beans and rice, also enjoy a Mexican beer or a soda included with your meal. Afterwards your tour will head to your hotel.